In the month of May, the phases of the Moon bring much more than patterns to be followed. The month will be marked by a certain amount of sensuality and greed for establishing and realizing plans and dreams. Are you ready? 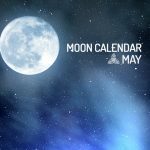 Next, check out the lunar calendar for May 2019 and some tips and recommendations to get organized and prepare for the coming month, based on the May moon phases. As early as May 4th, New Moon appears in the sky. Alongside it, planetary formation suggests planning and interactions with a dash of sensuality and an appetite for results. These characteristics provided by the stars could not be more appropriate, since the New Moon brings with it a moment where the resumption and the plans for a new phase are indispensable. This period can be great for anyone who wants to renew the look or save a relationship that is falling into the rut. Enjoy all the seduction in the air. Starting on the 11th of May, the First Quarter will continue to maintain the sensual trend of the beginning of the month, so this behavior can be reflected in both love and finances. Too much will, daring and impatience should also mark the period. Take advantage of all this impulsivity to put into practice the plans outlined earlier this month. This is a lunar phase where things grow and flow easier, so take that as a basis for action. When we get to the 18th of this month, the Full Moon brings with it energies that are also directed towards family life, and you will feel more willing to deal with home affairs. More emotional, in the face of lunar action, moments of agitation, but extremely pleasant, should be part of your week. Take care of health and appearance, but without exaggerations or radical changes. Avoid getting in the way of friends, family, or loved ones, as fighting during the Full Moon tends to extend for a long time. Especially on the 20th, the Full Moon promises to energize the couples in love with a very romantic and sensual night. What an intense month, right? On the 26th, it is the turn of the Last Quarter. Although the moon is almost disappearing in the sky, this phase is ideal to finish pending issues, reflect on our past attitudes and have a well deserved rest. Do not close deals now or make love commitments. According to the lunar calendar for May, everything that starts now tends to end quickly. As you can see, in May the phases of the Moon must be filled with many emotions, greed and sensuality about all of us. Your personal desires will probably stand out, and younger people may feel a certain stir in doing and undoing things. Despite so many feelings, in some areas of life this excess may not do well. When it comes to professional, financial, or any other subject that requires an extra dose of caution, try to let go of all that will to act with the heart, and make use of rationality.